The younger sister of Charleston church shooter was arrested for bringing weapons and drugs to A.C. Flora High School where she attended, in Richland County, South Carolina. Morgan Roof, 18, was charged with simple possession of marijuana and two counts of carrying weapons on school grounds. 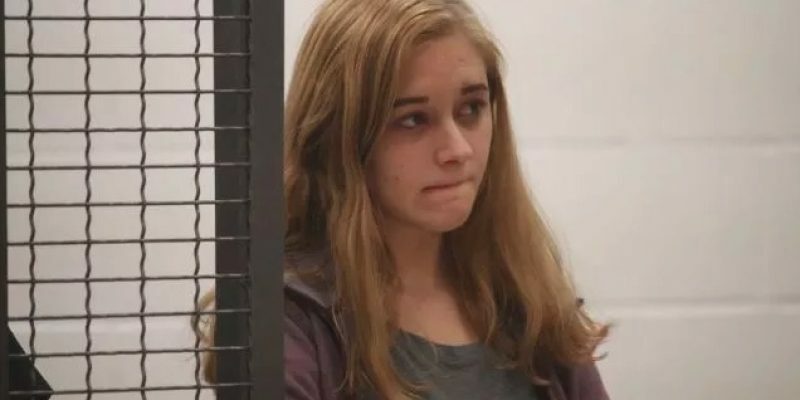 The judge set a $5,000 bond and mandated that she is prohibited from returning to A.C. Flora High School. 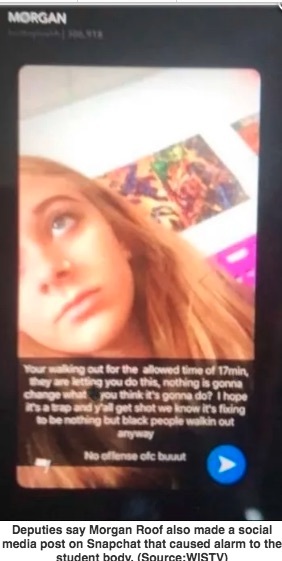 Roof also posted on Snapchat that she hoped students were killed on the national walk-out on Wednesday. AC Flora is fortunate to have a close and caring community which is open to sharing information. I want to thank those of you who have called to share concerns about what you may have heard from our students. In an effort to stop rumors, I would like to explain recent events that have occurred at AC Flora. As many of you know, today was set as a time for a student walkout. Our student leaders had asked to be allowed to spend seventeen minutes to remember each of the victims of the Parkland, Florida school shooting. This student-led event was voluntary. The walkout went well with only a minor verbal disagreement that occurred at dismissal from the event. A rumor then started that a certain student had a weapon. This was heavily investigated and found to be inaccurate. In a separate situation, a student used social media to post a hateful message. The posting was not a threat, but was extremely inappropriate. That student was dealt with in a swift and severe manner as the posting caused quite a disruption. In an isolated incident yesterday, administration was notified that there was possibly a weapon on campus. Through diligent work from the Assistant Principals and the School Resource Officers, an unloaded weapon was recovered. The investigation of this matter involves law enforcement as well as school officials. Discipline for students involved will follow the Richland One Code of Conduct. I realize that rumors and the tragic school shootings in Florida are events that can cause anxiety for our students, parents, faculty, and the community. Be assured that the safety of our students will always be our top priority. We must continue to work together to maintain a safe and positive learning environment. Please feel free to contact me at 803.807.8697 if you have questions or concerns. Potential tragedy was avoided at AC Flora High School. In two separate incidents, students and educators reacted quickly to reports of suspicious activity and behavior to their Richland County Sheriff’s Department school resource officer. We owe a debt of gratitude to all involved who acted so quickly and decisively. For months, I have called on the General Assembly to join me in placing a trained, certified police officer in every school, in every county, all day, every day. We don’t need anymore legislative study committees, debates, or deliberation, we know what we need to do and we need action now. Today was proof positive. Roof was arrested after an administrator at the school contacted a school resource officer. Next Article Why did it take Georgia 40 years to execute convicted ‘stocking strangler’ serial killer?